You'll be £18.00 closer to your next £10.00 credit when you purchase The Polish 'Few'. What's this? They came to fight for freedom and their country, they came to fight Germans. Men of the Polish Air Force, who had escaped first to France and then to Britain, to fly alongside the Royal Air Force just as Fighter Command faced its greatest challenge – the Battle of Britain. Many of the Polish airmen joined existing RAF squadrons. The Poles also formed their own squadrons, but only four became operational during the Battle of Britain: Nos. 300 and 301, were bomber squadrons, with another two, Nos. 302 and 303, being fighter squadrons. Flying Hawker Hurricanes, both 302 and 303 squadrons were active by the middle of August 1940, just when they were most needed, at the height of the Battle of Britain, with Fighter Command stretched to its limit. The Polish squadrons, battle-hardened from their encounters with the Luftwaffe during the invasion of Poland and Battle of France, soon made their mark. In particular, 303 Squadron become the highest-scoring unit of Fighter Command. The great strength of this outstanding book is that the Polish author, resident in the UK, is obviously bilingual. He is therefore ideally placed to research RAF records and contrast them with Polish sources, including pilot memoirs and other historical books. This book is a great testament to the courage of the pilots of the Polish squadrons, and the part they played. A great book and well recommended. This excellently researched and written book is an in depth look at those 145 Polish airmen and their service in the Royal Air Force. Even giving accounts of each individual pilot, this really is a magnificent book. Highly recommended book for those interested in the Battle of Britain and Polish Armed Forces. The author deserves great admiration for his work, and the manner in which he has presented this. In addition, my thanks to Pen & Sword for publishing this valuable work, and allowing me to read and review it. I recommend it highly. This excellently researched and written book is an in depth look at those 145 Polish airmen and their service in the Royal Air Force. Even giving accounts of each individual pilot this really is a magnificent book. Highly recommended book for those interested in the Battle of Britain and Polish Armed Forces. 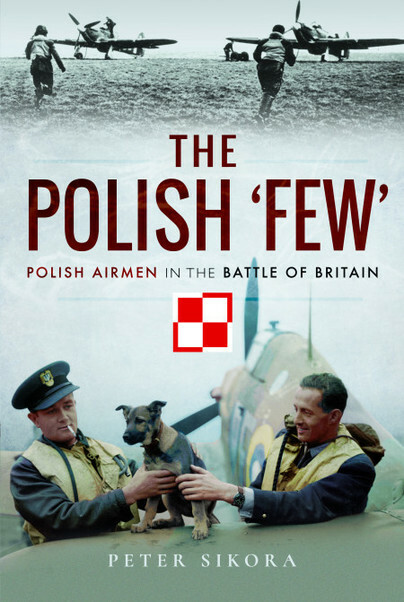 The Polish Few examines the relationship between British and Polish aviation since 1915 and includes personal accounts from Battle of Britain veterans, plus detailed biographies of the Polish Battle of Britain pilots. This masterful book is perhaps the ultimate document describing the essential contribution of Polish airmen to success in the Battle of Britain. Author Peter Sikora's research leaves no stone unturned, and the detail included in this epic work will take some beating. The first and most important thing to note about this book is not to be put off by the title. Yes, it does have 256 pages of biographies of the 145 Polish airmen who fought in the Battle of Britain, but it also has 302 pages and 14 pages of endnotes of a well-researched and very readable record of Polish aviation and its involvement in the Battle of Britain. The narrative starts with relatively brief reviews of the establishment of Polish Military Aviation between the wars, the invasion of Poland in 1939 and the establishment of an independent force within the French Air Force. It ends with an equally brief commentary on the later part of the Second World War and the post war-era. The main substance of the book is therefore the involvement of the Polish Government in Exile and Polish Airmen in the Battle of Britain. The book attempts to debunk many of the myths about the Polish contribution during this period and is liberally supported by direct quotations from participants and leading figures of the period. The proof reading and typographical errors leave a bit to be desired, but it is important not to let this detract from the underlying message. The substantial biographical section on the 145 Polish pilots who fought in the Battle of Britain contains much new information and corrects some of the errors known to exist in earlier reviews. There have been a number of books published in recent years on Polish aviation and airmen of this period but, if you only need one, this it. Peter Sikora is an aviation researcher, historian and writer who specialises in the history of the Polish Air Force between 1918 and 1946, with the particular interest in the achievements of the Polish airmen during Second World War. Based in Berkshire, England, Peter has already had a number of books published in Poland, including Aces of the Polish Air Force, Battles of the Polish Air Force 1918-1945 and Polish Wings over Ireland. He also writes historical articles for the leading Polish aviation magazines. In his private life, he is married to Maggie, and together they run a non for profit organisation that helps to reduce unemployment.